Concerned by the steady increase in the number of children who are starting kindergarten without proof of updated vaccinations, public health officials in the Bay Area will meet in November to look into the possibility of tightening the system that allows parents to opt out from mandatory immunizations. Six percent of the state’s kindergartens – up from 2 percent a decade ago – have so many unvaccinated children that public health officials consider them “sites of concentrated vaccine-preventable disease risk,” according to a 2009 report by the California Department of Public Health. At these schools, more than 10 percent of the students were exempted from providing proof that they’re up to date with all their vaccines. Ten percent may seem like a small number, but it’s enough to “put a school at risk of an outbreak of a vaccine-preventable disease if the disease was introduced,” said Dr. Robert Schechter, chief of the immunization branch of the state Department of Public Health, located in Richmond. The issue is of increasing concern to medical leaders in California, where a whooping cough outbreak this year has made more than 5,000 people sick and resulted in the deaths of nine babies. Officials strive to keep immunization rates high enough to confer “herd immunity,” or “community immunity,” to the population. Herd immunity occurs when the vaccination of a portion of the population provides protection to unvaccinated people. Depending on the disease and the community in which it might occur, in order for unvaccinated people to be protected against communicable diseases, approximately 75 to 95 percent of the population has to be vaccinated against them, medical experts say. “For example, the level of vaccine coverage necessary to retain herd immunity to measles, a vaccine preventable disease that has recently caused outbreaks in schools, is estimated to be 83 percent to 94 percent,” said Schechter. The 20 states that appear in green – California among them – allow parents to get a personal belief exemption for their child. The states highlighted in pink allow parents to opt out of vaccination only for religious reasons. (Credit: Institute for Vaccine Safety, Johns Hopkins University). Enlarge this map. In California, children starting kindergarten must show proof that they have had five doses of the whooping cough vaccine, four of the polio, three of the hepatitis B, two of the combined measles-mumps-rubella and one of the chickenpox vaccine, or that they have been sick with the chickenpox instead. In total, 10,280 kindergartners in California had personal belief exemptions in 2009. That’s 2 percent of all the state’s kindergartners. California is in the midst of a whooping cough epidemic that has made roughly 5,300 people sick in 2010 – the most cases reported in 60 years. Nine people have died, all of them babies. Eight of them were under two months of age, too young to be vaccinated against the disease. The ninth baby had received the first dose of the vaccine two weeks before getting sick, according to the California Department of Public Health. Whooping cough is the common name for pertussis, a bacterial respiratory infection that causes a persistent, fitful cough that can be life-threatening for infants. Highly infectious, it gets its name from the characteristic “whoop” sound that happens as people gasp for breath, although many babies under six months of age don’t develop the whoop. In California, some counties where the rates of personal exemptions are high have suffered more cases of whooping cough. In Marin, for example, 7 percent of kindergarten students had personal exemptions – the highest rate in the Bay Area. The county has been particularly hard hit by whooping cough, with more than 300 cases so far this year. But other counties that have been hard hit by the disease, such as the Central California county of Madera, don’t have particularly high rates of vaccine exemptions, said Catherine Martin, executive director of the California Immunization Coalition, a non-profit group in Sacramento. This map shows the rate of personal belief exemptions in California counties in 2009. 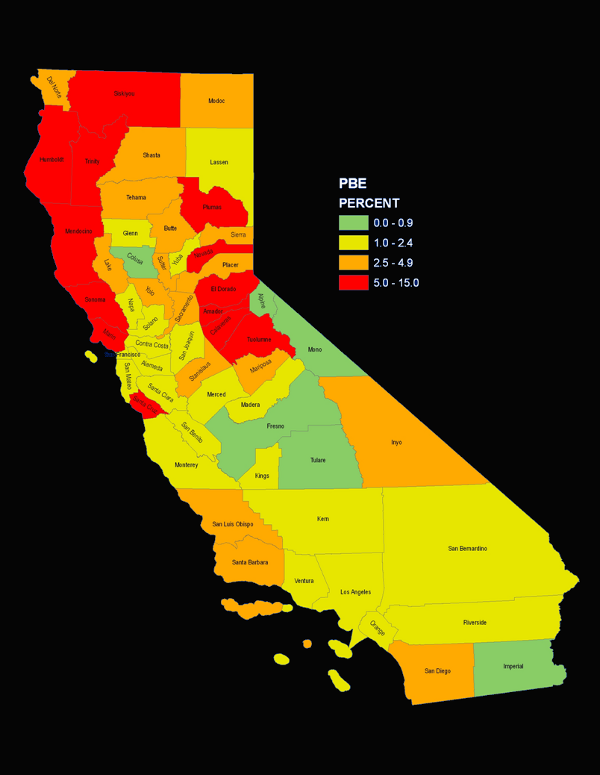 (Credit: California Department of Public Health) Enlarge this map. In Marin, two private schools have the county’s highest rates of personal belief exemptions. At the Marin Waldorf School, in San Rafael, 31 of the 49 kindergartners had personal belief exemptions in 2009, a rate of 63 percent. So did eight of the 19 kindergartners at Mill Valley’s Greenwood School. Among Marin’s public school districts, the two schools with the largest number of kindergartners with personal belief exemptions are in the Ross Valley School District. At Brookside Elementary, 15 out of 126 kindergartners have exemptions this year, a rate of 12 percent, and at Manor Elementary, 16 kindergartners – or 25 percent of the school’s 58 kindergartners – have exemptions. “I think it is very easy for parents to sign the waiver,” said the school district’s nurse, Laurel Yrun. Yrun said most of the parents who are signing exemptions in her district are doing so because they have opted not to give their children a particular vaccine. Only a minority of parents are opting out of vaccines altogether, she said. The most popular vaccine to skip in her district is the hepatitis B, followed by polio and the measles-mumps-rubella, she said. The whooping cough vaccine was the least likely to be skipped in her district, she said. Nonetheless, the district was hard hit by whooping cough during the past school year. In Marin, only 87 percent of kindergartners had been vaccinated against whooping cough in 2009, compared to 93 percent statewide. The California Department of Public Health hasn’t studied the characteristics of the parents who obtain exemptions. But research by Omer and his colleagues in Colorado, Massachusetts, Missouri and Washington confirms Yrun’s experience. 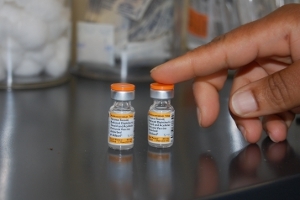 They found that only 25 percent of exempted children didn’t receive any vaccines at all. In the case of whooping cough, other factors in addition to personal belief exemptions have contributed to the epidemic in California, said Martin, of the California Immunization Coalition. For example, immunity to the bacterium that causes the disease wanes over time, so a large number of teenagers and adults are currently unprotected. Children receive the fifth dose of the DTap vaccine that protects against whooping cough at age four or five. But by the time they’re 10 or 11, they need a booster shot called Tdap, which only became available in 2005. In September, Gov. Arnold Schwarzenegger signed into law an update to the health code that will require schools to check that children starting middle school have received the Tdap booster shot, starting in July of 2011. In 1998, English doctor Andrew Wakefield published a study of 12 children linking the measles-mumps-rubella vaccine to autism. The paper caused rates of vaccination to fall and cases of measles to climb in the United Kingdom. Wakefield’s research has since been discredited. In February, the medical journal the Lancet retracted his paper, saying that its authors had made false claims about how the study was conducted. Nonetheless, the paper’s effects are still being felt, said nurse Yrun. “That’s been refuted, but once it’s been out in the media, parents hang onto it,” she said. Concerns were also raised about thimerosal, a mercury derivative used as a preservative in some pediatric vaccines. It was eliminated in the United States from all but some flu vaccines in 2001. And numerous studies have found no connection between thimerosal and autism, the most recent of which was a Centers for Disease Control paper published in September. “While we still need to find out the cause of autism, it seems quite clear that vaccinations are not one of them,” said Dr. Robert Benjamin, public health officer of Alameda County. Benjamin is one of the public health officers who will be attending a meeting organized by the California Immunization Coalition in mid-November. The meeting will bring together a small group of private doctors, public health officials and representatives of medical associations interested in discussing possible changes to the personal belief exemptions, said the coalition’s Catherine Martin. Benjamin said that in Alameda County, 11 percent of the people who have contracted pertussis had a personal belief exemption. Benjamin said he would like to change the exemption’s wording so that it makes parents reflect on the impact their decision might have on the community. Or he would like to make it more difficult to obtain. After studying personal belief exemptions around the country, Emory University’s Omer has come up with a guideline for those designing exemptions. “It shouldn’t be easier to have your child exempted than to have your child immunized,” he said. Omer has found that replacing a pre-printed form with a letter crafted by the parents in which they explain why they want the exemption could be an effective way to curtail the number of exemptions. Some states even require the letter to be notarized. A counseling session, viewing a video, or visiting the health department are some of the educational measures that have also been effective, he said. His team didn’t study the language of the exemptions in detail, he said. So he said he couldn’t comment on whether adding new wording to California’s form might help. When the California group meets, the biggest challenge they might face is deciding who should be given the job of educating parents, if an educational component is agreed upon as the solution. In fact, the state Legislature, facing record deficits, reduced the budget of the Department of Public Health’s infectious disease branch immunization program by $18 million last week, Martin said. In Marin County, nurse Yrun said she’s curious to see how the efforts to change the exemptions system will pan out. But the whooping cough epidemic has raised concern among parents who are giving their children all their vaccines. To find out how many children might be under-vaccinated at your school, download the 2009 Immunization Status of Kindergarten Students in California (.pdf, 676 KB). Watch our QUEST story about Northern California researchers searching for the causes of autism. Thanks for writing this article. I find it interesting that state-wide, PBEs are around 2%, and the minority of those eschew all vaccines. It is an article of faith in some quarters that “there’s a rising tide of resistance to vaccines” — the evidence is to the contrary. It’s also interesting that the mere format of the PBE request can have such an effect. I do hope that California will adopt a request form that requires parents to give more thought to the request. Lets also remember that the people who contracted whooping cough in that portion of the country were in the vaccinated community. I see how that info was conveniently left out of a newspaper article that is SUPPOSED to report the news, not slant the opinions of those who read it!! California will come against a huge backlash if they try to change the laws on immunization. The vast majority of people who contracted whooping cough or measles in the last few years were fully immunized. What this article did not speak of is the fact that most of the cases of pertussis were of a mutated strain of bordetella pertussis that the vaccine cannot prevent against and that measles was mostly in immunized people. But fear mongering is what the media does best. Those of us who do not vaccinate our children are fine to roll our eyes and ignore it for the most part, but when you start talking about changing the laws and taking away our right to choose what is right for our own children… the media will see soon enough to an extent they can no longer ignore how large the anti-vaccine community has grown and that we are not going to give up on our children and we are not going to inject them with toxic substances. Herd immunity is a complete myth and we’re not endangering anyone so they’d better leave our rights alone!! im just angry. i could go into exactly what happened to 2 of my children due to the triggering effects of vaccinations but i have no time and would like to get this artiicle out of my head. i love how it was stated,” i dont know WHY these parents are not immunizing their children.” yes you do know WHY!! OH WAIT, WE ARE JUST A BUNCH OF IGNORANT CRAZIES THAT WANT TO FIND SOMETHING TO BLAME THE AUTISM ON…….YEAH. I FORGOT. agh. Many parents opt out because they have experienced a significant vaccine reaction. My son had a “contaminated” DPT, back in 1994. He had severe brain injury as a result. I have been caring for a vaccine injured child, who is now an adult for years. I opted out of vaccinating my other children, as vaccine injury is very REAL to my family. Out of all of the news reports I read, including this one, Vaccine injured persons are never mentioned, yet, being a strong advocate for vaccine choice, I know that vaccine injury is the motivating factor. There are tens of thousands of reports of adverse events reported this decase from the DTaP vaccine, far more serious, adverse events than deaths from Pertussis. ~My children should not have to indure medical proceedures to protect your children, not when those proceedures carry significant risks…risks that I live with on a daily basis. ~When inquiring as to WHY parents do not vaccinate, it is because they ARE having reactions to vaccines. Doctors do not acknowledge those reactions quite often, as they are not going to make waves with the Pharmaceutical Industry. Doctors are hevily compensated by the Pharmaceutical Industry…. ~Ask any parent of a child with “REGRESSIVE AUTISM” (autism that comes on suddenly around 2 years old, not ever seen before in that child)…..Almost ALL of Those parents report that it started right after a set of vaccines, not just MMR, but all different vaccines have been indicated. These are parents that have video of a normal child, until they were vaccinated, then the child is severely autistic. The parents all know it were a set of vaccines…yet the industry keeps lying to the parents….big time. There is plenty of evidence to support this, “Age of Autism” is a book that is new to the market, and I highly suggest people read it! THE CDC NEEDS TO GET REAL ABOUT WHY PEOPLE ARE NOT VACCINATING. VACCINE INJURY IS THE LEADING CAUSE AND IS NEVER MENTIONED IN THE ARTICLES. CHECK THE VACCINE ADVERSE EVENT REPORTING SYSTEM YOURSELF. WHEN YOU SEE THE AMOUNT OF VACCINE INJURY REPORTED, PERHAPS YOU WILL HAVE A BIT MORE COMPASSION FOR THOSE WHO CHOOSE NOT TO VACCINATE OR THE VACCINE INJURED, LIKE MY SON…WHO IS LIVING WITH A SEVERE DISABILITY OVER THE DPT VACCINE. VACCINE INJURY IS VERY REAL. No medical intervention–not Tylenol, not ear tubes, not even a BandAid or a “natural” remedy–is 100% safe. It is true that some people have bad reactions to vaccines and that in a very small number of cases among the millions vaccinated every year, there are long-term adverse effects. I know a family who experienced this; indeed, their child cannot be vaccinated and relies on others to vaccinate as protection for him. However, 10 children have died in this pertussis outbreak, which calls for close monitoring of vaccination and encouragement to parents and older adults to ensure that they are caught up. Regardless of your feelings about vaccines and autism, the pertussis vaccine has never been one of the “culprits” linked to autism. It’s not MMR (link thoroughly debunked) and it does not contain thimerosal (link thoroughly debunked). DPT/TDaP, etc., are not contaminated; the problem with one of these 16 years ago does not exist today. The deaths of these infants is very real and an intensely urgent matter for any parent who has just celebrated the birth of a child only to watch that child die of a preventable disease. Please read as much as you can of factual information and try not to let personal stories of terrible exceptions affect your own decisions. 1. Whooping cough– immunity from vaccination wears off, and lasts at most a decade. That is the reason that teen and adult boosters are being recommended. It’s not just whooping cough — vaccine immunity to tetanus also wanes. 2. Whooping cough — the 10 infants who have died to date were not immunized, as they were too young. 3. 2008 measles outbreak in San Diego — one unvaccinated child passed it on to 11 other children, only one of whom was partially vaccinated. Ava also wrote: “Herd immunity is a complete myth”. That’s an assertion on her part, which is entirely ficticious. There are about 1,000 studies on PubMed evaluating various aspects of how having a high vaccination uptake rate slows transmission and protects the unvaccinated. People who believe in reason and evidence don’t have the luxury of just making things up to advance their arguments. Rita, having an adult child with sever disabilities is difficult, and I am sympathetic, as I have said before. You have left many similar comments at other pro-vaccine posts. The gist of your story is that you claim your son received a vaccine in 1994 that was contaminated and recalled. You also claim that particular lot caused brain injury to several other children. However, you don’t provide evidence of your claims of the “hot lot” and the recall other than your assertion. I know you believe your assertions, but until you provide evidence that the lots were recalled and that other children were injured, they are just your assertions. VAERS is a passive reporting system, meaning that reports about adverse events are not automatically collected but require a report to be filed to VAERS. VAERS reports can be submitted voluntarily by anyone, including healthcare providers, patients, or family members. Reports vary in quality and completeness. They often lack details and sometimes can have information that contains errors. “Underreporting” is one of the main limitations of passive surveillance systems, including VAERS. The term, underreporting refers to the fact that VAERS receives reports for only a small fraction of actual adverse events. The degree of underreporting varies widely. As an example, a great many of the millions of vaccinations administered each year by injection cause soreness, but relatively few of these episodes lead to a VAERS report. Physicians and patients understand that minor side effects of vaccinations often include this kind of discomfort, as well as low fevers. On the other hand, more serious and unexpected medical events are probably more likely to be reported than minor ones, especially when they occur soon after vaccination, even if they may be coincidental and related to other causes. A report to VAERS generally does not provide sufficient basis for concluding that the identified vaccine(s) caused the adverse event described. It only confirms that the reported event occurred sometime after vaccine receipt. No proof that the event was caused by the vaccine is required in order for VAERS to accept the report. VAERS accepts all reports without judging whether the event was caused by the vaccine. In other words, anybody can add anything to the VAERS database without verification. In 2005, Jim Laidler MD entered a claim that a routine influenza vaccine turned him into the Incredible Hulk. The following year, Kev Leitch verified Dr. Laidler’s claim. Matthew, as has been widely reported: immunity against whooping cough (pertussis) wanes over time. Immunity from the natural disease may also wane — we don’t know for sure yet, as it hasn’t been studied. That is why the recommendation for adolescent and adult boosters cam about. Pertussis (whooping cough) is annoying in adults, but not as dangerous or debilitating as it is in infants. Few physicians even know about this type of vaccine injury, so it is almost always diagnosed as “autism”. The Hannah Poling is such a case where a child suffered a regression, was diagnosed with “autism” and was then compensated for a vaccine encephalopathy (she had both DTaP and MMR) which caused her autistic symptoms. HHS has NEVER looked at the encephalopathy cases that they have ruled vaccine injuries to see how many of them either have or qualify for an autism diagnosis. It is also important to note that while 10 have died from pertussis, 30 have died following the pertussis vaccine. These cases are almost never investigated and the CDC just brushes them off as coincidence. LMAO… I invite you to go check out VAERS and attempt to write an event into the database yourself so you could see what it’s like, or read the entries alone so you can tell the formatting, it’s not so simple. Also FDA officials have conceded that DOCTORS (never mind the layperson who are not told by our physicians that we may report adverse reactions to VAERS) only report 5-10% of all adverse reactions to vaccines from the most mild to the most severe. As for if those reactions get followed up or not to determine causation, it’s laughable! VAERS is indeed a passive and hugely inadequate system. Really it’s a miracle to me that people like you can sleep at night when you’re making such heartless and brainless statements in favor of vaccines. I’m not going to engage with commenters after this post as my experience tells me that doing so is akin to banging one’s head against a very hard wall. Encephalopathy is not autism. Sorry. Hannah Poling’s situation was unusual in that she had an existing mitochondrial disorder, and it has been discussed extensively. To imply that it is autism in the standard sense is to be either willfully or ignorantly misleading. For anyone who is genuinely interested in information, rather than emotion, anecdote, and innuendo, please seek out the reliable sources that I posted below. Don’t rely on what you read on comment threads, from me or anyone else. Use reliable sources that offer data and solid information. There is no conspiracy among the hundreds of thousands of doctors, public health experts, scientists, drug developers, and the government to kill your child or injure your child. Rely on facts, not on comment threads. I have a heart in the sense you mean, and I have a brain, also in the sense you mean, and I do my best to be helpful with information and to avoid attacking people personally. Data are available for people to become informed about the risks, which are tiny. I don’t say that to dismiss the people who have experienced severe vaccine reactions, and I worried about reactions every single time each of my three children got their shots. Illogically, I worry less about buckling them into the car every single day, even though statistically, that’s far more dangerous. By stating the fact that no medical intervention is 100% safe, I am simply stating a fact. It is not meant to diminish the effects of a severe vaccine reaction. Your anger leads you to infer things about my comments that are not true. And I sleep at night because of the various medications I must take for my health. No miracle, just medical science helping me along. Just like vaccines. Ava, your mocking tone makes anything you write so much less credible. It explains how smallpox has basically been eradicated with the help of universal vaccination. It is helped by the fact that smallpox comes in one form, and has no carrier state. “Part of herd immunity functions to decrease the number of people in a population who carry the disease so that an at risk population are not exposed. Part of herd immunity functions by preventing the spread of some, especially viral, diseases. If there are not enough vulnerable people in a population, the disease cannot spread and perpetuate. However this mechanism for herd immunity is less helpful with bacteria, which can colonize or cause less obvious disease. a rose by any other name would still be brain damage! Call it what you like! “What the government isn’t saying is that, independent of a true genetic issue, mitochondria can be taxed into a state of stress that predisposes any child to autism risk. So some children may not have any underlying “disorder” until they’re exposed to an onslaught of vaccinations, some of which contain ingredients that can harm your mitochondria. I’d hesitate to call this site “proof”: the site’s creator doesn’t seem to have any respect for the scientific method whatsoever. It’s one thing to be against for-profit pharmaceutical companies, big government, or conventional wisdom … but the scientific method has proven pretty durable and non-partisan. Indeed, a closer look at the site reveals it to be filled with typical anti-intellectual, conspiracy theory stuff, with sections on 9/11 “Truth,” intelligent design, and perhaps most disappointingly, an unsubstantiated claim that not only are vaccines unsafe, but that they’re a sham and don’t create immunity. You do your movement no favors by associating with such fringe characters. Dunning-Kreuger is in full effect here! The people who are on the side of science and actual knowledge of body systems, chemistry, medicine, etc offer thoughtful, nuanced, opinions with realistic caveats and assessments of the data about vaccine risks and benefits while the people who have absolutely no knowledge of the same feel free to make unequivocated blanket statements about the evils of vaccines. Why bother to study something for decades when you can just make crap up and declare yourself an “expert”? I mean, what’s more unique and valuable, a degree that represents years of research, critique from qualified experts, publication that furthers our knowledge of the subject and (possibly) providing care for countless people or the ability to crap out a couple kids. Amazing how many folks put more value on the latter. Folks, remember that your conspiracy involves literally thousands of people across the entire world that would have to all be purposefully working to harm their children, their family’s children, their neighbors’ children, etc. When you spout this nonsense you are insulting and degrading people who spend their lives trying to save and extend yours. It’s despicable and ignorant. Hi All – I’m the editor of the blog here on QUEST. Just a reminder that name-calling is a violation of our use policy, and will not be tolerated. Ava, this is the 2nd comment of yours I have had to remove. As the parent of an autistic child myself, I understand full well the range of emotions this topic touches upon, but If you cannot participate in a civil manner, you will be banned. What Byron Richards, CCN isn’t saying (directly) is the government, every doctor, every lab technition, nurse and medical science professor is out to hurt your babies. Millions of people with the intent to harm everyone else. What’s the motive? There’s no profit in genocide so they must simply be evil. Then how do we explain the the good things these people do? The babies they save through surgery and other treatments? When you look at the claims of the Anti vax community they simply don’t make any sense. They insist on a world view that requires so much human hatred that the world would have to be different in so many other ways. The world has seen hatred and it manifests itself much more simply. The world has also seen unjustified paranoia and it looks like the anti vax movement. These are very vague statements. If they sound like they are describing autism it is probably because they could describe a great many conditions that affect the brain. That doesn’t mean they are the same thing. My uncle was in a really bad car accident a while back, and now has some brain damage–these symptoms could describe his case pretty well. That doesnt’ have anything to do with autism. 2. 30 died from pertussis vaccine? Source? Ginger, please provide a reliable source for that claim. If you can’t, we then must assume you are making it up. Again, sources or you are just making stuff up. Again. Question the logic not the source. If you cannot do so you don’t have a valid argument against something. Ginger any evidence on how the CDC responds to claims of vaccine damage or deaths then? Because as far as I know reported adverse reactions are ignored. Just because there are Pubmed studies that reference herd immunity does not mean they are “evidence” of herd immunity. Cite some specific references please. And whooping cough outbreaks have had nothing to do with low vaccine uptake, the US has some of the highest rates of vaccine uptake in the world and if you would look at the actual epidemiological studies you would see the vast majority of people infected were fully vaccinated. What is the specific data from which you have gleaned that the risks “are tiny”. After all there is paltry safety testing conducted prior to the licensing of these drugs, there has never been ANY safety testing of the effect of the cumulative doses of vaccinations in the recommended childhood immunization schedule, and as doctors only report 1-10% of all serious adverse reactions and deaths to VAERS and those go largely uninvestigated, that is obviously not a reliable source to estimate the risks of vaccination. So I’m just curious where you are getting this information from. It covers the history of studies of DTwP and the lack of any association w/ an increase in severe events and also covers the shift to the DTaP formulation that’s used in the US today. Worth a read in this context. How many more children have to die to prove the dangerous of vaccination! I am a lucky mom – my fully vaccinated children yet seam to be healthy. I am not sure about their future and how all of that poison ingredients will live and act in little bodies. NO ONE can force to put the needle in my child anymore! Even I have to move from California. And why all of you, who poisoned their children should be worry? You are on the safe side, sleep well, get your Flu shot! But leave my babies, they can not harm your vaccinated children, aren’t they?! You pro-vaccine fools! Your “health officials” refer to groups of human population as “herds” (paragraph six and final paragraph). Look up the word “herd” in a dictionary. When used to refer to people, it is derogatory! Do you really believe that your government health officials care about you and your health when they think of you as cattle!?! THINK ABOUT THIS “LOGICALLY” GUYS: OUR PRECIOUS IMMUNE SYSTEMS ARE NOT “DEFICIENT” OF PRESECRIPTION DRUGS, AND THE “TOXIC” INGREDIENTS THAT “ARE” IN VACCINATIONS: MERCURY, THERMISOL, ANIMAL DNA, MONKEY “BALLS”? OR ANY OTHER CHEMICAL INGREDIENT WHICH THE CONVENTIONAL WORLD BELIEVES IS HEALTHY FOR US. THE ONLY LOGICAL WAY OUR IMMUNE SYSTEM WILL GET STRONG TO FIGHT OFF DISEASE IS TO GIVE OUR BODIES ALITTLE “RESPECT” IN FEEDING IT WITH AS MUCH “ORGANIC” PRODUCE/PHYTONUTRIENTS THAT WE CAN POSSIBLE STAND! ALONG WITH NATURAL VITAMIN D SUNSHINE, YOU WILL ALL FIND OUT FOR YOURSELF BY TRYING TO LIVE THE ORGANIC “ALTERNATIVE” MEDICINE LIFESTYLE, WHICH BASICALLY MEANS….GO “GREEN” AND YOU WILL ALL REAP THE REWARDS OF AMAZING HEALTH. DRUGS AND VACCINATIONS ARE ALL ABOUT THE BIG PHARMA “BRAINWASH” AND GOVERNMENTAL “GREED”! THEY SUPPRESS OUR IMMUNE SYSTEMS RIGHT INTO DISEASE, NOT PREVENT IT! MY NATURALPATHIC DOCTOR SAYS….THE UNVACCINATED RARELY NEED TO SEE HIM….THEY ARE THE HEALTHY KIDS BY FAR! ALL DISEASE “CAN” BE REVERSED NATURALLY, THROUGH ALTERNATIVE MEDICINE, AND THE ORGANIC LIFESTYLE! ALL YOUR ANSWERS ARE SITTING IN YOUR LOCAL HEALTH FOOD STORE, JUST WAITING TO BE DISCOVERED! DO NOT RELY ON THE BIG PHARMA OR THE GOVERNMENT TO CONTROL OUR HEALTH! IT’S OUR CHILDREN, OUR CHOICE, AND GET EDUCATED FOR THE LOVE OF THEM! DR. TENPENNY AND DR. MERCOLA MAKE ALOT OF LOGICAL SENSE IF YOU DARE TO READ? BOTTOM LINE HERE…WE ARE NEVER “DEFICIENT” OF “TOXIC” INGREDIENTS, JUST GOOD OLD-FASHIONED “ORGANIC” NUTRIENTS AND MINERALS. THEY WILL BUILD THE TOUGHEST IMMUNE SYSTEM AND YOU CAN SEE IT FOR YOURSELF, BY SIMPLY NEVER GETTING SICK! NO NEED TO ARGUE BACK AND FORTH, IF YOU HAVE NOT CLIMBED BOTH SIDES OF THE FENCE! THANK YOU TO THE REAL HEROS IN PREVENTING DISEASE….ALTERNATIVE MEDICINE AND THE ORGANIC INDUSTRY! YOU WILL “SOON” REAP YOUR REWARDS! WE TRULY ONLY NEED CONVENTIONAL MEDICINE FOR “DIAGNOSIS” AND ABSOLUTE “EMERGENCY”, IF WE ARE “REALLY” HEALTHY? THE INSURANCE REFORM WILL NEVER BE FIXED UNLESS WE ALL TAKE RESPONSIBILITY FOR OUR “OWN” HEALTH! GO “ORGANIC”….GO “GREEN”……AND BE RESPONSIBLE! The whole basis of immunization is built on the basis of a THEORY!!!! It is called the “Germ-Theory”. Here is the definition of a theory: a unproven assumption. I have a B.S. in Nursing, and worked for the Public Health Department in cities in Virginia and Ohio. I was “taught” or what I call indoctrinated into the belief in the “need” for routine immunization. The drug companies earn billions and billions of dollars on this scam. And they appeal to our wanting to be “good” parents. This article is typical of how statistics can be manipulated. Here is an example from above: “…Benjamin said that in Alameda County, 11 percent of the people who have contracted pertussis had a personal belief exemption.” What is wrong with that statement? 11 percent who contracted pertussis had a personal exemption…..And what about the OTHER 89% who did not have a personal exemption? I would bet my last dollar that those 89% had been immunized? Where is the information in the above article relating those particular statistics? How many of the ones who made up the numbers of pertussis cases HAD received immunization? I do not see those numbers above, but as with the statement that I quoted above, those numbers are inferred. And a school district nurse in Marion County (I was also a school district nurse), quoted in the above article admits that in her district the parents opted out of some immunizations but not all. Here, I will quote the article, “Yrun said most of the parents who are signing exemptions in her district are doing so because they have opted not to give their children a particular vaccine. Only a minority of parents are opting out of vaccines altogether, she said. The most popular vaccine to skip in her district is the hepatitis B, followed by polio and the measles-mumps-rubella, she said. The whooping cough vaccine was the least likely to be skipped in her district, she said.” Yet, the article is saying that Marion County had the most pertussis cases in the state. Am I the only one who can see that this article is not only blatantly bias, but is telling horrible lies, manipulating facts. I applaud all people who can think for themselves, and do not just subject their children to the dictates of the medical mafia. By the way, there is a book by a doctor about immunizations and its hazards, called, “The Medical Mafia”. It is a great book. I say “NO, NO and more NO” to ALL vaccines.